Research on stem cells is advancing knowledge about how an organism develops from a single cell and how healthy cells replace damaged cells in adult organisms. This promising area of science is also leading scientists to investigate the possibility of cell-based therapies to treat diseases that are typically referred to as regenerative or reparative medicine. Regenerative medicine aims at helping the body to form new functional tissues to replace lost or defective ones. Hopefully, this will help to provide therapeutic treatment for conditions where current treatment modalities are inadequate. Human body has an endogenous system of regeneration through stem cells, where stem cells are found almost in every type of tissue. The popular notion is that restorations of functions are best accomplished by these stem cells. Regenerative medicine comprises the use of tissue engineering and stem cell technology. 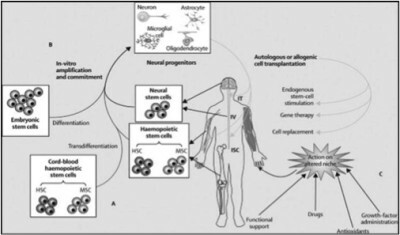 This review is not meant to be exhaustive, but aims to highlight present and future applications of stem cells in this exciting new emerging discipline. The economic and psychological burdens of chronic, degenerative, and acute diseases in the world are enormous. It has been estimated that up to many millions of people suffer from such diseases either directly or indirectly. As more research takes place, the developmental potentials of different kinds of stem cells will become better understandable. As per our current understanding, adult stem cells are limited in their potential to differentiate. However, embryonic stem cells have a great differentiation capacity, and are thought to be able to differentiate into almost any types of tissue. Thus, different types of stem cells isolated from different tissues could have different applications. The potential applications of stem cells are discussed below. Many nervous system diseases result from loss of nerve cells. Mature nerve cells cannot divide to replace those that are lost. Thus, without a new source of functioning nerve tissue, there won’t be any therapeutic possibilities. Thus neural stem cells could be good tool for the regeneration of new neurons. In this disease, nerve cells that make the neurotransmitter dopamine die. Dopamine is chemical that allows messages to be sent to the parts of the brain that controls movement and some forms of thinking. The traditional method of treatment includes the drug Levopoda, which was discovered in the 1960s that substitutes the action of dopamine in the body but doesn’t slow down or reverse the damage caused to the nerve cells in the brain. Although the underlying cause of Parkinson’s disease (PD) is unknown, scientists do know which cells and areas of the brain are involved. Researchers are already using stem cells to grow dopamine-producing nerve cells in the lab so that they can study the disease, especially in those cases where there is a known genetic cause for the condition. Because a single, well-defined type of cell is affected, it may also be possible to treat Parkinson’s by replacing the lost nerve cells with healthy new ones. Doctors and scientists think replacement therapy will work because of the results of transplantation studies done in 1980s -90s. Scientists remain optimistic that introducing young cells into the brain could better treat Parkinson’s disease, but not enough fetal tissue is available to treat the large numbers of people with PD, and the use of fetuses also raises ethical questions. Embryonic stem (ES) cells could be directed to make dopamine-producing neurons, which could be transplanted into patients. Dopamine-producing neurons have been made from both mouse and human embryonic stem cells in the laboratory, and the human cells have recently been shown to have similar effects as the fetal cells in a rat model of Parkinson’s disease. Induced pluripotent stem (iPS) cells could be made from a patient’s adult skin cells in the lab, and then used to make dopamine-producing neurons. In 2010 scientists in the USA treated rats with neurons made from human skin cells using iPS techniques. The transplanted neurons improved features of Parkinson’s disease in the rats. However, mice and rats require fewer neurons than humans and it is not yet clear whether this approach would work in patients. More studies are also needed to make sure the cells are safe and would not cause tumors in the brain, and also do not rapidly develop the pathology of Parkinson’s given they are derived from the patients themselves. In Alzheimer’s disease, the cells that are responsible for the production of certain neurotransmitters die. Alzheimer’s is the most common form of dementia. The first sign of Alzheimer’s often include lapses on memory or struggling to find the right words. Overtime, symptoms include confusion, mood swings or memory loss develop and become increasingly severe. Currently there is no permanent cure for this disease but for temporary cure there are certain drugs administered that help in improving the memory or ability to manage the everyday tasks. Most of these drugs belong to a class called cholinesterase inhibitors (e.g. Aricept, Exelon, Reminyl). These drugs can help prevent the breakdown of a natural substance in the brain called acetylcholine, which carries signals between neurons. However, there are no drugs that delay or halt the loss of neurons. However there are no stem cell treatments available yet but scientist are engaged actively in the research on stem cell transplants in mice and studies have shown some benefits. Another possible approach to stem cell therapies might be use of certain types of stem cells to deliver proteins called neurotrophins to the brain as these proteins help in supporting and sustaining the growth of neurons in a healthy brain. These are produced in lower levels in the Alzheimer’s patient. 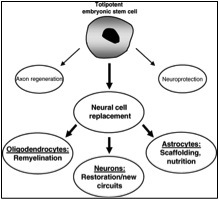 Induced pluripotent stem cells, mesenchymal stem cells, and neural stem cells. The spinal cord is the delicate tissue encased in and protected by the hard vertebrate of the spinal column. It is made up of millions of nerve cells that carry signals to and from the brain and out into the other parts of the body. A spinal cord injury is a devastating and debilitating condition affecting the people all over the world, particularly young adults affecting both neurons and the myelin sheath that insulates axons. Generating new supporting cells that will re-form the insulating nerve sheath (myelin) and acts as a bridge across the injury to stimulate re-growth of damaged axons. Protecting the cells at the injury site from further damage by releasing protective substances such as growth factors and soaking up toxins such as free radicals, when introduced into the spinal cord shortly after injury. Preventing spread of the injury by suppressing the damaging inflammation that can occur after injury. There are many clinical trials undergoing in many research institutes and universities in Germany, USA and Europe using neural stem cells, Mesenchymal stem cells, and embryonic stem cells. Multiple sclerosis (MS) is a disease that affects the nerve cells in the brain and spinal cord. In the healthy body, these nerve cells carry messages between the brain and rest of the body. 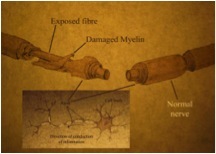 In MS, the body’s own immune system attacks the nerve cells so that they cannot function properly. There is currently no cure for multiple sclerosis but it is possible to treat the symptoms and reduce the number pf relapses using medicine, exercise and physiotherapy. If i were a scientist, i would invent a device that would probably help us in our daily life. A device that would help us to keep up with our daily chores as well as our health. Yes; i am talking about the “Mind Controller”. Well in my device there would be 2 ways controlling. One would be the mechanical controller and the other emotional controller. Now, let me make you familiar with my mechanical controller. This would function as a multitasker. It is a small device which is worn around the head, and it is connected to the computer or laptop or i phone via Bluetooth. It is a simple looking machine that would do the most complicated job! Now, since, your brain is connected with the computer the screen acts as a projector of our thoughts or projects what we are thinking. If you want to watch a movie from you tube, just think about it and you will find a YouTube page popping up on your screen and think of a movie, it starts playing. The same with the music lovers. Just connect the speakers to your computer and think of a song from your playlist and you would start enjoying your favourite songs. Well this was a simple way of mechanical mind controller. The other way to use any device is indeed helpful for the disabled on physically challenged. Along with a device which you wear around your head, you need to attach a sensor to any convenient place for the people using wheel chair, sensor is connected to their wheel chair or a person with artificial limb or hand, the sensor can be attached to these artificial limb or hand respectively. So with the help of the controller and sensor, a person on a wheel chair can move around wherever he/she wishes to go without anyone’s help or he/she would hurt his or her hand in moving the wheels of the wheel chair. Similarly if a person with an artificial limb wishes to walk comfortably without trembling, falling, then he/she can do it effortlessly. In fact this can be used for a person with paralysed limbs and arms too. My device would also help in reading a person’s mind. This would help in medical fields, if a person is in coma; then, as mentioned earlier brain can be connected with a desktop or laptop to know what is going on in that person’s mind at that moment. Not only that, we can also read what is going on in a deaf and dumb person’s mind; as he/she is unable to express thoughts or feelings through words. So we can picturise and interpret what that person is thinking. These were some ways of mechanical control of mind. Now, let’s move on to the emotional control of our mind. As humans, we think a lot, stress ourselves, get irritated, we get tensed and angry and what not? All these emotions have an adverse effect on our health. Because of our stress we get many diseases such as BP, Diabetes etc. Also we suffer from sleeplessness. Now a days, humans of all ages are suffering from a very dangerous disease. each and every person on this earth has this illness. We can find this where ever we go. This illness may be found among the siblings, friends and relatives, among a couple and also within ourselves. This illness is nothing but “Human Ego”. We suffer from pride of wealth, pride of knowledge, pride of beauty and pride of power. We become egoist when we talk and think too much about ourselves. Our outer beauty fades away with the age when our ego starts ruling our mind. It causes us to forget our self. So to overcome these and to explore our true inner beauty and potential, we must control our mind and keep it free from all such ill thoughts. Coming to my advice; it would probably act as an indicator of our emotions, like when you are too much stressed out or tensed or angry then it would send an electrical signal to your brain to control your emotions and control the anger or hyper excised state. When you are angry, it would not allow you to speak, along with signalising the brain to calm down so that you would avoid having an unnecessary argument with your colleuge, friend or siblings. Controlling such type of excited emotion also helps you to maintain a good relation with people around you and keep you free from all the diseases. Thus controlling our mind mechanically and emotionally is very necessary to live in this digital era as physically, mentally and emotionally controlled person. 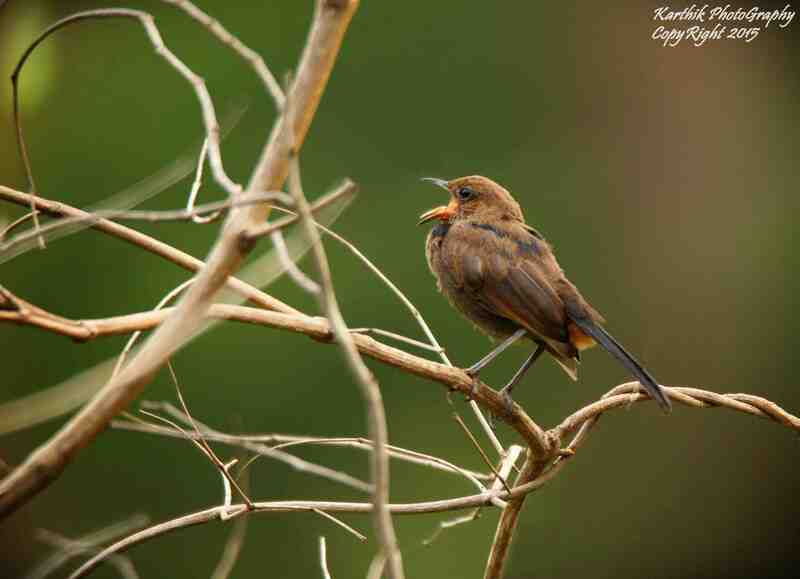 This month Mr. Karthik Sai takes us to the forests of South India to spot some common and some unusual bird species. 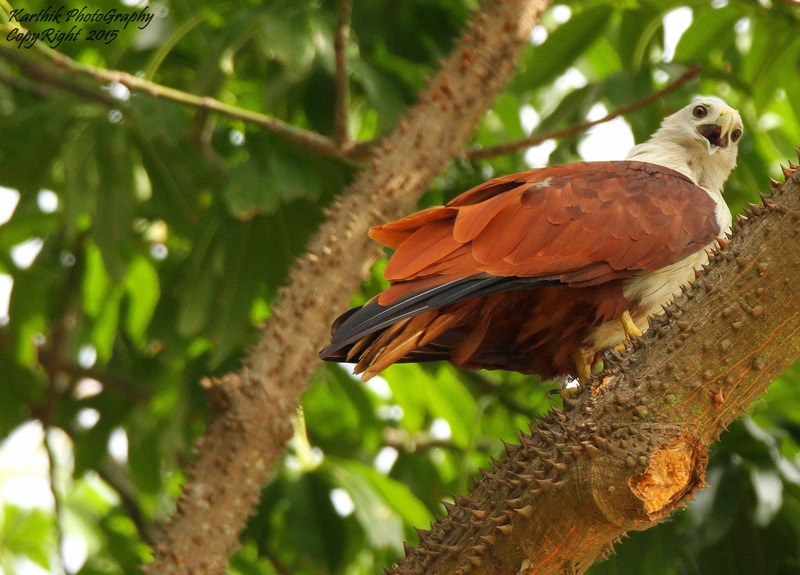 The Brahminy kite (Haliastur indus) also known as the red-backed sea-eagle in Australia, is a medium-sized bird of prey in the family Accipitridae, which also includes many other diurnal raptors, such as eagles, buzzards, and harriers. They are found in the Indian subcontinent, Southeast Asia, and Australia. They are found mainly on the coast and in inland wetlands where they feed on dead fish and other prey. Adults have a reddish brown plumage and a contrasting white head and breast which makes them easy to distinguish from other birds of prey. 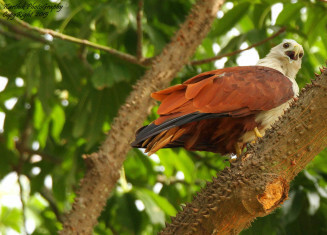 This kite is a familiar sight in the skies of Sri Lanka, Nepal, India, Pakistan, Bangladesh, and southeast Asia and as far south as New South Wales, Australia, through which region it is widespread and resident. They perform seasonal movements associated with rainfall in some parts of their range. They are mainly seen in the plains but can sometimes occur above 5000 feet in the Himalayas. It is evaluated as being of least concern on the IUCN Red List of Threatened Species. However the species is on the decline in some parts such as Java. 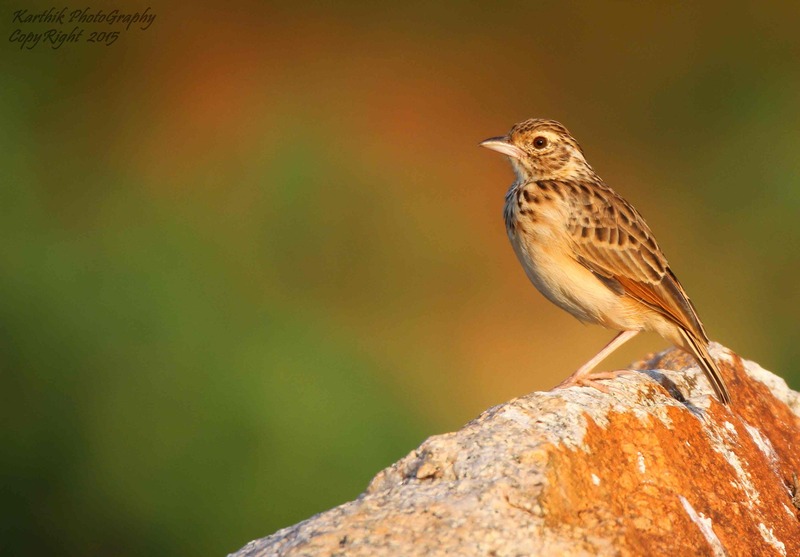 Jerdon’s bush lark (Mirafra affinis) is a lark of the open countryside found in southern India and Sri Lanka. This species was earlier considered a subspecies of the Bengal bush lark (M.assamica). However recent studies of differences in call and distribution have led to it being treated as a full species. It has proven adaptable to a variety of open habitats up to a maximum elevation of 1500 meters. Some of these are forest perimeters, rocky scrubland, scrubby hill meadows and clearings in open-type forests, shrub-edged unused croplands, and thickets of bamboo. Its song-flight is indistinguishable from that of Indian bush lark, However, unlike the aforementioned species, Jerdon’s bush lark often perches on trees and wires. The Red-rumped Swallow (Cecropis daurica) is a small passerine bird in the swallow family. It breeds in open hilly country of temperate southern Europe and Asia from Portugal and Spain to Japan, India and tropical Africa. The Indian and African birds are resident, but European and other Asian birds are migratory. They winter in Africa or India and are vagrants to Christmas Island and northern Australia. 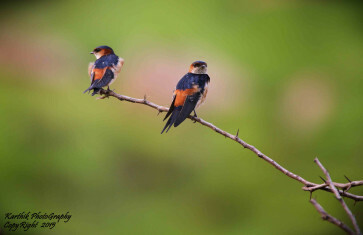 Red-rumped swallows are somewhat similar in habits and appearance to the other aerial insectivores, such as the related swallows and the unrelated swifts (order Apodiformes). They have blue upperparts and dusky underparts. They resemble barn swallows, but are darker below and have pale or reddish rumps, face and neck collar. They lack a breast band, but have black undertails. They are fast fliers and they swoop on insects while airborne. They have broad but pointed wings. Red-rumped swallows build quarter-sphere nests with a tunnel entrance lined with mud collected in their beaks, and lay 3 to 6 eggs. They normally nest under cliff overhangs in their mountain homes, but will readily adapt to buildings and bridges. They do not normally form large breeding colonies, but are gregarious outside the breeding season. Many hundreds can be seen at a time on the plains of India. The little cormorant (Microcarbo niger) is a member of the cormorant family of seabirds. Slightly smaller than the Indian cormorant it lacks a peaked head and has a shorter beak. It is widely distributed across the Indian Subcontinent and extends east to Java, where it is sometimes called the Javanese cormorant. It forages singly or sometimes in loose groups in lowland freshwater bodies, including small ponds, large lakes, streams and sometimes coastal estuaries. Like other cormorants, it is often found perched on a waterside rock with its wings spread out after coming out of the water. The entire body is black in the breeding season but the plumage is brownish, and the throat has a small whitish patch in the non-breeding season. These birds breed gregariously in trees, often joining other waterbirds at heronries. 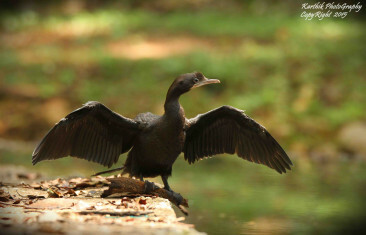 The little cormorant is found across India, Sri Lanka, Bangladesh and lowland Nepal. It is also found in parts of Burma, Thailand, Laos, Indonesia. It is not found in the Himalayas, but vagrants have been seen in Ladakh. It inhabits wetlands, ranging from small village ponds to large lakes, and sometimes tidal estuaries. The little cormorant is about 50 centimetres (20 in) long and only slightly smaller than the Indian cormorant (Phalacrocorax fuscicollis). The Asian koel (Eudynamys scolopaceus) is a member of the cuckoo order of birds, the Cuculiformes. It is found in South Asia, China, and Southeast Asia. It forms a superspecies with the closely related black-billed and Pacific koels which are sometimes treated as subspecies. The Asian koel is a brood parasite that lays its eggs in the nests of crows and other hosts, who raise its young. They are unusual among the cuckoos in being largely frugivorous as adults. The name Koel is echoic in origin with several language variants. The bird is a widely used symbol in Indian poetry. 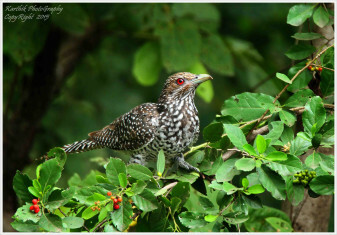 The Asian Koel is a large, long-tailed, cuckoo measuring 39 to 46 cm (15 to 18 in) and weighing 190 to 327 g (6.7 to 11.5 oz). The male of the nominate race is glossy bluish-black, with a pale greenish grey bill, the iris is crimson, and it has grey legs and feet. The female of the nominate race is brownish on the crown and has rufous streaks on the head. The back, rump and wing coverts are dark brown with white and buff spots. The underparts are whitish, but is heavily striped. The other subspecies differ in colouration and size. The upper plumage of young birds is more like that of the male and they have a black beak. They are very vocal during the breeding season (March to August in South Asia), with a range of different calls. The familiar song of the male is a repeated “Koo – Ooo”. The female makes a shrill “kik-kik-kik” call. Calls vary across populations. The Indian robin (Saxicoloides fulicatus) is a species of the family Muscicapidae. It is widespread in the Indian subcontinent, and ranges across Bangladesh, Bhutan, India, Nepal, Pakistan, and Sri Lanka. The males of northern populations have a brown back whose extent gradually reduces southwards with populations in the southern peninsula having an all black back. They are commonly found in open scrub areas and often seen running along the ground or perching on low thorny shrubs and rocks. Their long tails are held erect and their chestnut undertail covert and dark body make them easily distinguishable from the pied bushchat and the oriental magpie robin. This bird is found in open stony, grassy and scrub forest habitats. They are mainly found in dry habitats and are mostly absent from the thicker forest regions and high rainfall areas. All populations are resident and non-migratory. The species is often found close to human habitation and will frequently perch on rooftops. The species was introduced into the New York region but did not establish. A vagrant or escape has been noted from the Maldives. They feed mostly on insects but are known to take frogs and lizards especially when feeding the young at the nest. Individuals may forage late in the evening to capture insects attracted to lights. 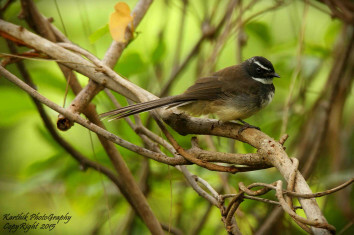 The White-spotted Fantail or spot-breasted fantail (Rhipidura albogularis) is a small passerine bird. It is found in forest, scrub and cultivation in southern and central India. The adult white-spotted fantail is about 19 cm long. It has a dark fan-shaped tail, edged in white, and white supercilium and throat. Birds are mainly slate grey above, with a black eye mask, and a white throat and eyebrow. It has whitish underparts, and a grey breast band that is spotted white. The white-spotted fantail lays three eggs in a small cup nest in a tree. The white-spotted fantail is insectivorous, and often fans its tail as it moves through the undergrowth. Not normally renowned as a songster, the male uses a fixed and unmistakable pattern of musical notes in its call. The notes are loud and normally divided into two stanzas ñ the first with 5 to 6 trilling notes rising and falling, followed by 4 to 5 notes rising up the scale and ending in the highest note. 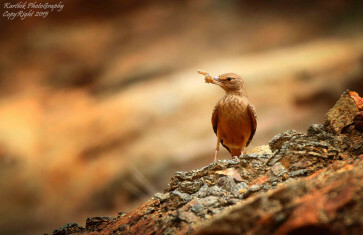 Birds use the same song year after year, with progressively small changes, with the result that the song sounds very different after 4 to 5 years. The male’s call is a valuable tool in detection and identification of the bird. The Rufous-tailed Lark (Ammomanes phoenicura) also sometimes called the rufous-tailed finch-lark is a ground bird found in the drier open stony habitats of India and parts of Pakistan. Like other species in the genus it has a large finch-like bill with a slightly curved edge to the upper mandible. The dull brown colour matches the soil as it forages for grass seeds, grain and insects. Males and females are indistinguishable in the field but during the breeding season, the male has a courtship display that involves flying up steeply and then nose-diving and pulling up in a series of stepped wavy dips accompanied by calling. They forage on the ground in pairs or small groups. The species is found mainly in low altitude dry regions in open habitats without significant tree cover. It is a resident mainly within India south of the Ganges extending west to Kutch and the Aravallis of Rajasthan. They are summer visitors to parts of Pakistan in northern Punjab and in southern Nepal. The species does not occur in Sri Lanka and reports of their occurrence on the island of Rameshwaram are not confirmed while the species is largely absent along the Western Ghats region particularly in Kerala. Usually seen on the ground, but sometimes perching on wires these birds are not secretive. The walk on the ground making quick dashes to capture insects and when disturbed crouch and stay still to flush only when approached very close. The breeding season is from February to May. The display of males involves rising high with deep beats of the wing and then descending in a series of nose dives accompanied by short burbling or chirruping notes. They also call while perched. The nest is built in a depression in the ground and two to four eggs form the typical clutch. The eggs are broad oval with some gloss. The colour is creamy or pale yellowish-white with spots all over but denser at the broad end. The incubation period has not been ascertained. India has a great diversity in domestic livestock and poultry genetic resources. Economically important species of livestock and a large number of breeds / strains within each of these species exist. Among domesticated livestock species, there are over 30 breeds of cattle, 10 breeds of buffalo, 42 of sheep, 20 of goats, 8 of camel, 7 of horses and 18 of indigenous poultry. Due to various reasons some livestock breeds are in immediate danger of loss and it is estimated that 1500 of the breeds of the world’s domestic animal species are now at high risk of extinction. Recognizing the importance of indigenous animal genetic resources, there is a need to conserve them for making their utilization in future. The goats are important species of livestock for India as they contribute greatly to the agrarian economy, especially in areas where crop and dairy farming are not economical, and play an important role in the livelihood of a large proportion of small and marginal farmers and landless laborers. Most of the breeds of goats are very well adapted to the harsh climate, long migration, and lack of vegetation and drinking water. There has been little effort to conserve and further improve the native breeds. The plethora of unique indigenous goat germplasm has not been fully characterized and explored. At present very few genes controlling economically important traits of goat have been identified and even the mapping of the genes is a long way from fully understanding their structure and function. Since we cannot characterize the differences between the goat breeds in terms of economically ( growth, milk) important genes, therefore general genetic variability is the most suitable criteria for identifying the breeds for genetic uniqueness. Genetic Characterization is the first step in the conservation programme, as it will help in breed prioritization. Keeping in view the sharp decline in biodiversity and then urgency to characterize the indigenous germplasm of different countries, Food and Agricultural Organization (FAO, 1996) of the United Nations has proposed an integrated programme for the global management of genetic resources including cattle using microsatellite methodology for breeding characterization. Microsatellites are markers that contain repetitive sequence composed of di-, tri-, or tetra- nucleotides. The number of repeats may vary from one person to other, i.e. polymorphic and follow mendelian inheritance. Microsatellites in different individual are not just the same or a different, they can differ by just a few repeats units. The reasons of Microsatellite popularity as genetic marker are that their high mutation rate makes them highly polymorphic, and they are relatively dense in the genomes of many organisms. Due to their high level of polymorphism, microsatellites are informative marker that can be used for many population genetic purposes, ranging from individual level to closely related species. A striking feature of the eukaryotes genome is that the coding sequences constitute only about 5 to 10 percent in the mammals, of the total genome. The apparently non- functional DNA is either the single copy DNA or the competitive DNA.The repetitive elements may be interspersed in the genome or may occur as tandem repeats. Tandem repeats consist of the same sequence repeated thousands or millions of times in tandem, thus forming discrete blocks of DNA. Interspersed repeats on the other hand consist of specific sequences dispersed around the genome but not forming tandem repeated blocks. In mammals, two major groups of the interspersed repetitive element can be recognized: the short interspersed elements (SINEs) and the long interspersed elements (LINEs). (Schmid and jelinek, 1982; Rogers 1983; Singer et al 1987). Both types of element are proposed to have originated by the reverse flow of information by retro position. The tandem repeats are broadly refers to as the satellite type of DNA. The satellite type is further classified as satellite, telomeric, minisatellite, and microsatellite DNA. Satellite often has a repeats unit consisting of hundreds or even thousands of nucleotide. Genetic variability in a small local goat population from the south of Italy were evaluated and compared with some international breeds. DNA polymorphism at microsatellite marker BMS2508 in four goat breed were studied by Ouyang xuxiang et al(2005) in order to obtain molecular markers for multiple embryos on goat. The average phenotypic heterozygosity degree of coat colour and morphological character were 0.3419 and 0.5207respectively. All these indicated that Chaidamu goat is a domestic Goat with less intensively selected breeds. Dinesh Kumar et al (2005) studied the genetic variation and management of Marwari goat. Genetic variation at 25 microsatellite loci, population structure and genetic bottleneck hypothesis were examined in Marwari goat in arid region of Rajasthan(India). The average polymorphism between the studied loci and the expected gene diversity in the population were 1.295 and 0.623±0.041 respectively.The population was observed to be significantly differentiated into groups and showed a fairly high level of inbreeding and global heterozygote deficit. A genetic profile of the Kalahari red goat from South Africa was studied by Kotze.A et al (2004). The erosion of Kalahari Goat with red boer goat is a major concern among breeders. Eighteen Microsatellite markers were applied to investigate the genetic diversity of the breed and to set up a molecular inventory. Genetic variation of the three commercial and three indigenous goat populations in South Africa was studied by Visser C et al (2004) by using ten microsatellite marker. Jandurova O M et al (2004) analyzed microsatellite variation in two breeds of goat, White short haired(WSH) and Brown short haired (BSH). Three markers originated from cattle, three from goat, and three from sheep within these seven loci- Allele frequency, Heterozygosity (H) Polymorphism information Content (PIC) and Genetic distance (D) were calculated. Both breed exhibited relatively high level of heterozygosity. Genetic diversity of sub Saharan African goat was assessed using 19 Microsatellite marker studied by Chenyambuga SW et al in 2004 breeds were sampled from eastern Africa (Massai, kigezil, Mubende) and western Africa ( Dwarf, Maure) and European breeds (Grizons , Stripped) and a middle breed were also included. 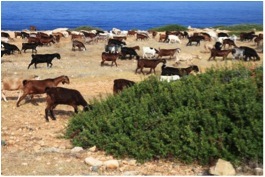 It was concluded that the relationship of sub- Saharan African goat breeds were accordingly to their geographical location implying that the goat of eastern Africa, west and south Africa are generally distinct within each sub region, goat population could be differentiated according to morphological characteristics. These are some example of researches done on finding goat genetic diversity. In the next episode we will see the research done on finding genetic diversity in Attapady goat by using 25 Microsatellite markers and its comparison with Mahasana Goat. 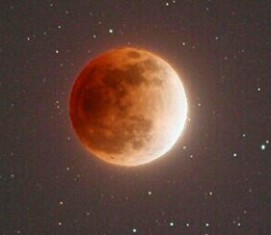 The Sep 27/28 Lunar eclipse was intently watched all over the world for it was a rare occurrence indeed. It was a total lunar eclipse, which was a part of a series of eclipses called a tetrad, at a time when it was closest to the earth in its orbiting path. 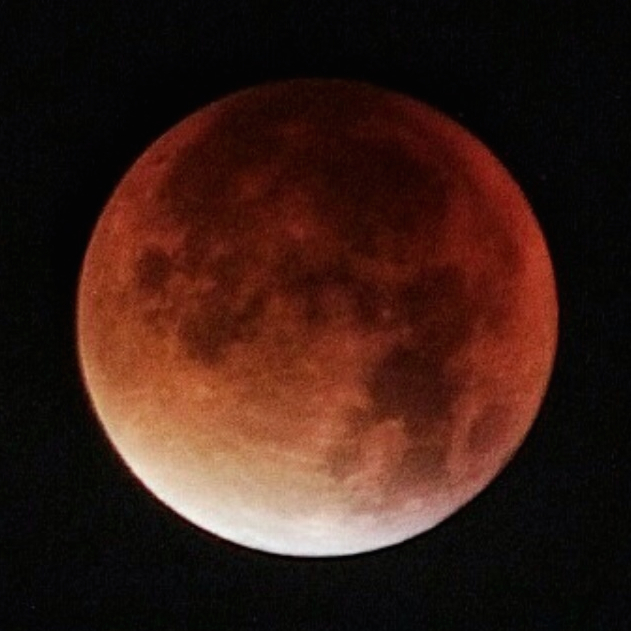 Only about one in three lunar eclipses are total lunar eclipses. Every once in a while, four total lunar eclipses happen in a row. This is called a lunar tetrad. A supermoon is the coincidence of a full moon or a new moon with the closest approach the Moon makes to the Earth on its elliptical orbit, resulting in the largest apparent size of the lunar disk as seen from Earth. The term “supermoon” is not astronomical, but originated in modern astrology. The technical name is the perigee–syzygy of the Earth-Moon-Sun system. A full moon at perigee is visually larger up to 14% in diameter (or about 30% in area) and shines 30% more light than one at its farthest point, or apogee. 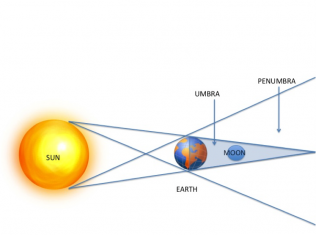 Like solar eclipses, lunar eclipses tend to occur in 18 year long cycles called Saros cycles. Lunar eclipses separated by a Saros cycle share similar features, including time of the year and the distance of moon from earth. Eclipses that are separated by a Saros cycle are included in a Saros series. The September 27/ 28, 2015 Lunar Eclipse belonged to Saros Series 137. It was the 28th eclipse and the last total lunar eclipse in a series of 81 lunar eclipses. The series began with a penumbral eclipse on December 17, 1564 and will end with another penumbral eclipse on April 20, 2953. The next Super moon eclipse of the tetrad is slated to happen on October 8, 2033.